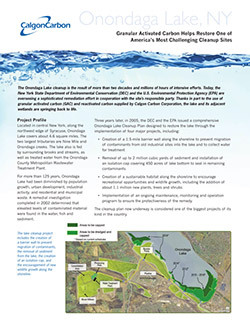 Calgon Carbon has been providing water remediation and treating perfluorinated compounds (PFOA, PFC, PFOs) for 15 years. We are the industry experts in treating these and other emerging contaminants from water sources. Additionally, we offer activated carbon reactivation. This means we will take the activated carbon back from you and recycle it at our facilities – saving you money, time and the risk associated with removing these hazardous contaminants. Calgon Carbon offers a comprehensive array of solutions for environmental and remediation water treatment applications to remove contaminants such as organic compounds, perfluorinated compounds, hydrogen sulfide, methyl tertiary-butyl ether (MTBE), trihalomethane (THM) and perchlorate. Calgon Carbon can provide the following treatment options for water remediation. Granular activated carbon and powdered activated carbon is used extensively in the remediation of contaminated groundwater through use in dewatering operations, direct pump and treat filter systems, soil stabilization, and after an air stripper. Calgon Carbon designs and engineers ultraviolet (UV) disinfection systems incorporating the Sentinel® product line to treat the flows of most open channel wastewater streams and combined sewer overflows. Combined with hydrogen peroxide, UV technology also is highly effective for the abatement of nitrosamines, pharmaceutical products, personal care products and endocrine disrupters.